Possibility of elemental gallium melting during prolonged X-ray analysis. Ga2p or Ga3d typically used. Using the Ga2p peak will give better depth resolution for sputter profiling. Ga3d electrons have higher kinetic energy and therefore have a deeper sampling depth compared to the low kinetic energy Ga2p electrons. The Ga3d region is sometimes more informative for chemical analysis. Ga2p region has significantly split spin-orbit components (Δ=26.9 eV, intensity ratio=0.491). 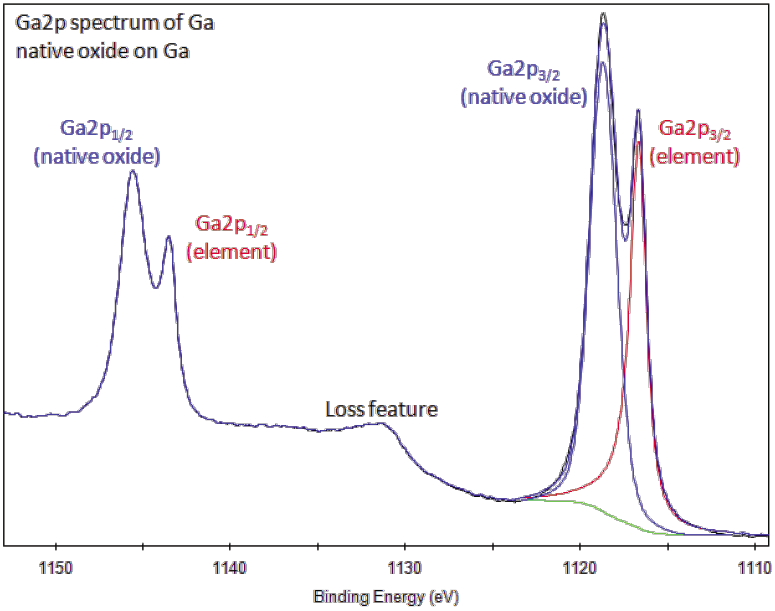 Ga2p peaks have asymmetric lineshape for elemental gallium and symmetric lineshapes for compounds. Typically only the Ga2p3/2 component of the Ga2p region is fitted and quantified. Loss feature may be observed between spin-orbit components ( 1130eV). Ga3d peak has overlapping spin-orbit components (Δ=0.46 eV, intensity ratio=0.633). Splitting is observable for elemental gallium but may be ignored for gallium compounds. 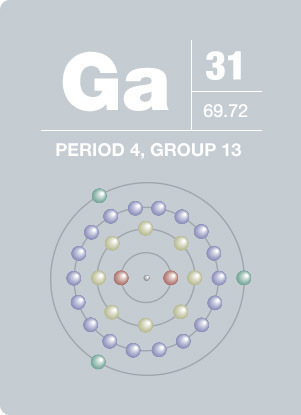 Ga3d overlaps strongly with In4d ( 17eV) and O2s ( 23.5eV) regions. 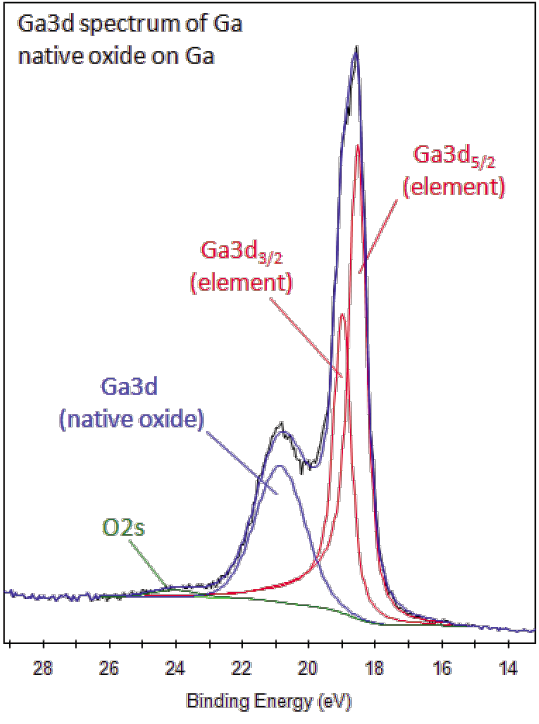 Ga3d peaks have asymmetric lineshape for elemental gallium and symmetric lineshapes for compounds. Ga LMM peaks (between 400eV-600eV) overlap with many XPS peaks from other elements. Very pure gallium metal has a brilliant silvery color. In its solid state, this metal fractures like glass. Due to its very low melting point, it is possible to melt gallium in one’s hand, although this is not recommended. When storing this element, special considerations must be taken into account. The metal expands when it solidifies, making glass storage difficult. It also attacks most other metals by diffusing into their metal lattice making storage in steel or aluminum containers impossible. Since gallium wets glass and porcelain, it can be used to create brilliant mirrors. Gallium nitrate has even been used in the treatment of arthritis.